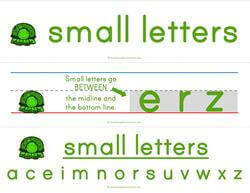 This section of print awareness resources focuses on the terms “tall, small and fall letters”. They refer to which part of the primary writing lines the letters touch or don’t touch. 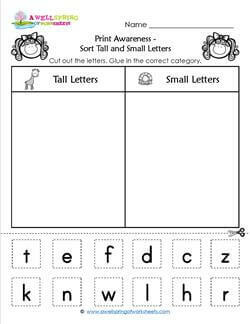 Using these categories helps kids to see there are three kinds of letters and brings a little more order to how they think about them. 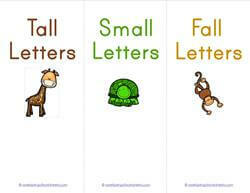 Though not necessarily a standards-based concept, tall, small and fall letters make learning letters a lot more fun! 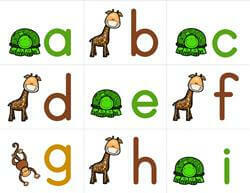 Each type of letter is represented by an animal – a giraffe represents the tall letters, a turtle represents the small letters, and a monkey represents the fall letters. 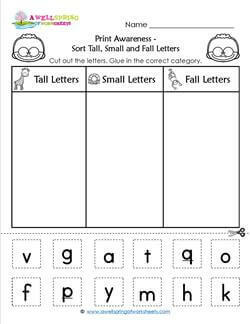 Be sure to scroll all the way down to see all the pocket chart cards, worksheets, and a set of sorting strips. Check out my blog post to see these resources in photos and get some pointers on how to use them in your classroom! Go to this page for more awareness of print resources. Look out for these tall letters! 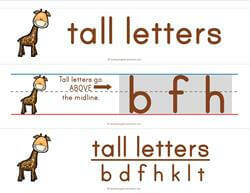 They're represented by a tall, yet sweet giraffe, to show kids that the tall letters touch both the top line the bottom base line (in most cases). One page with three cards. 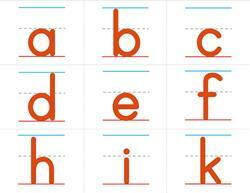 In this letter set all the letters come in the same color - orange. No color-coding or animals here to help kids sort them. 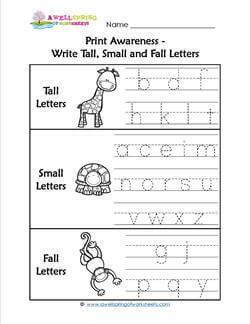 Kids will have to know what type of letter it is using the guidelines you've taught them. 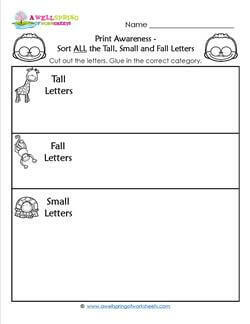 Here's a worksheet to sort small & fall letters. Kids cut out the twelve letters, decide which category they go into and glue them into the correct space. 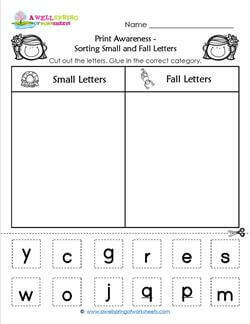 Here's a fun set of ALL the letters to sort. 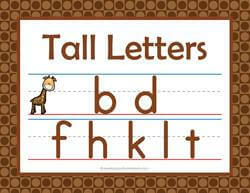 Cut out the letters and glue them into the matching category. 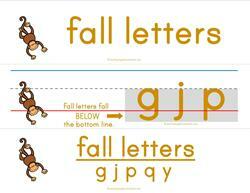 Two sets of letters are provided - cut the letters out individually or save cutting time and cut on the shared lines. 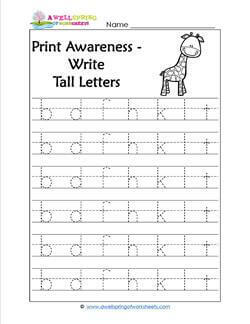 This worksheet has the seven tall letters - b, d, f, h, k, l, and t - neatly spaced on six primary writing lines so kids can easily trace them. 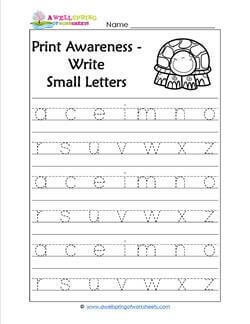 This worksheet is for kids to write small letters. The fourteen small letters - a, c, e, i, m, n, o, r, s, u, v, w, x, and z - repeat three times and are neatly spaced on six primary writing lines. 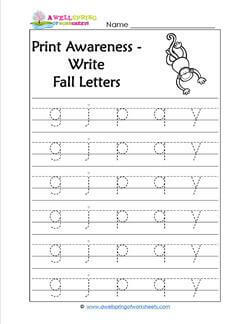 Each line of this worksheet has the five fall letters - g, j, p, q, and y - neatly spaced on primary writing lines so kids can easily trace them. 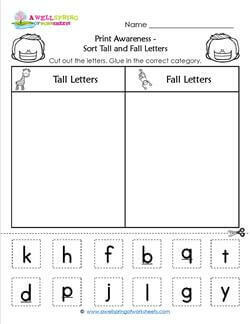 In this worksheet each set of letters is represented by an animal. 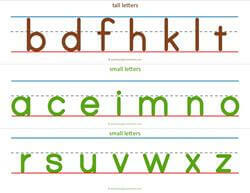 Kids trace the letters nicely and neatly on the primary writing lines. Then have them color the animals. These easy-to-use sorting strips will provide lots of sorting fun. 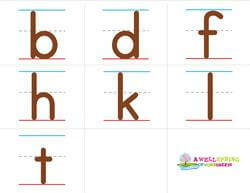 Cut out on the dotted lines, fold up 2-3 inches fron the bottom, put in baskets and sort the letters found on this page.